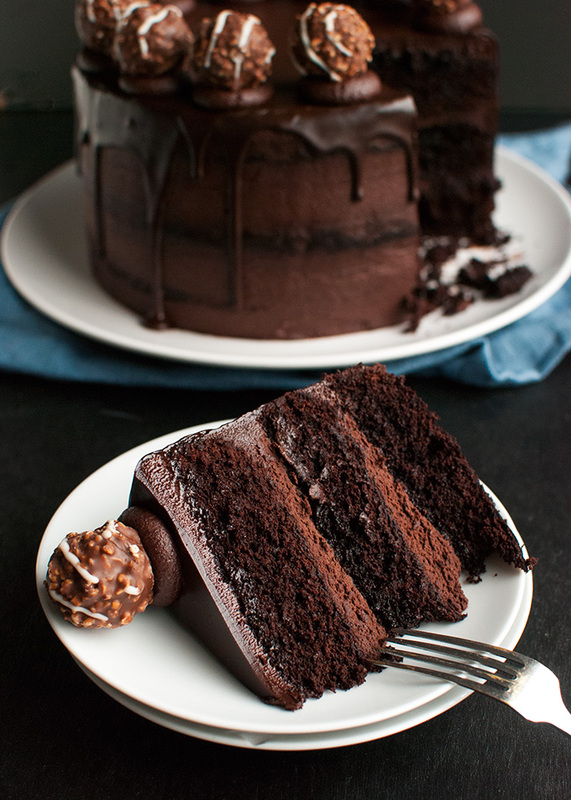 This Triple Dark Chocolate Cake is every chocoholic’s dream come true: three layers of moist, dense chocolate cake filled with a dark chocolate buttercream and topped with a dark chocolate ganache. Oh, and truffles. 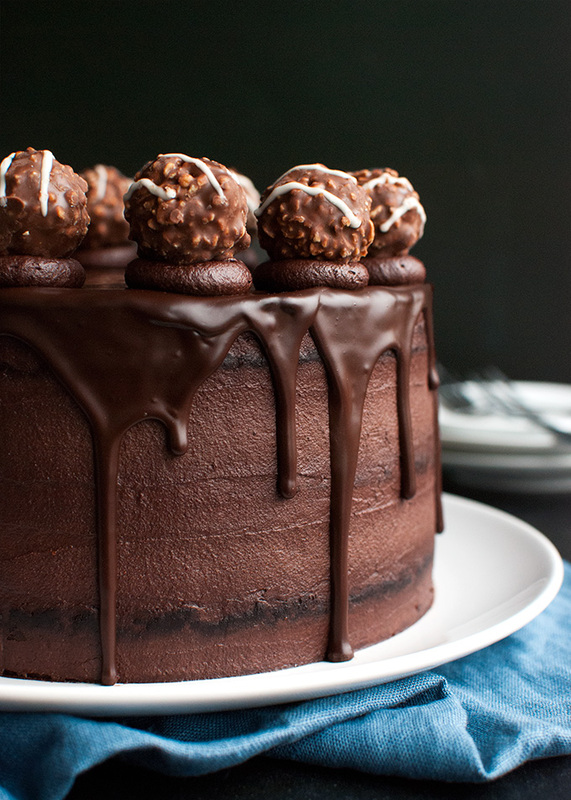 Because truffles make even this chocolate cake a little better. 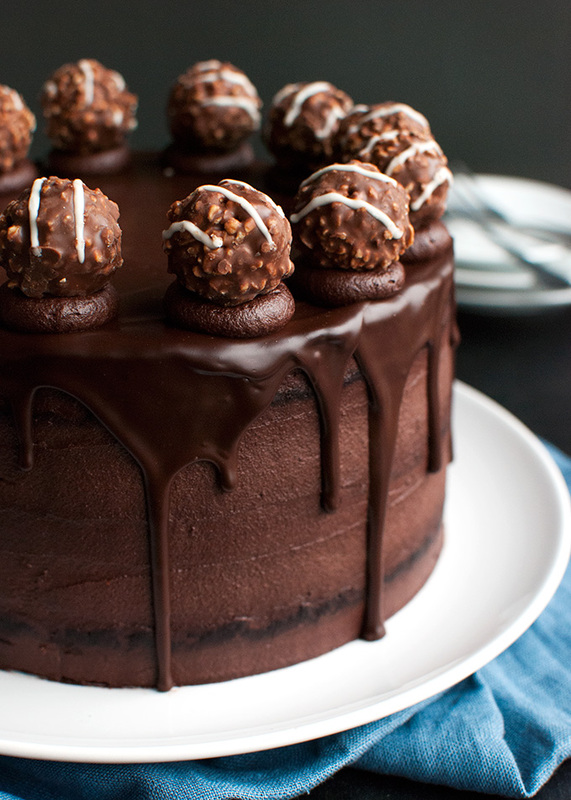 Can you ever have enough chocolate on a cake? I don’t think so! 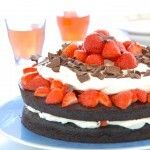 So when I was hit by a massive chocolate craving last week, I dreamed up – and then whipped up – this awesome cake. It’s chocolate. A LOT of chocolate. And surprisingly easy to make too! 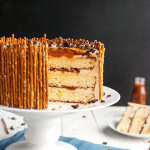 Sure, I’m an experienced baker, but the recipes for the different elements that make up this cake (cake layers, imbibing syrup, buttercream, and ganache) are really not difficult. So give this recipe a go and impress your friends (and maybe yourself?) while you’re at it! Just start with the cake layers. 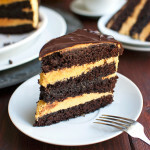 I used my trusty super chocolatey cake recipe for the layers. I’ve used it before to make my Chocolate Pumpkin Cake, and it’s actually a variation of my recipe for The Best Chocolate Cupcakes. It’s delicious! It also happens to be really easy to make. You just mix together granulated sugar, brown sugar, some oil and eggs. In another bowl, you combine flour, Dutch-processed cocoa powder (which tastes way more chocolatey than natural cocoa powder! ), baking soda, baking powder and salt. And in a third bowl you dissolve instant coffee granules in some hot water, then add buttermilk and vanilla. Throw the three mixtures together and mix until smooth. That’s done! I used three 18-cm/7-inch springform pans to make the cake layers, but you can certainly make these layers in regular cake pans. You can even adapt the recipe to fit your favorite cake pans. Just, if you do decide to use different size cake pans, don’t forget to adjust the amount of buttercream needed, too! While the cakes were in the oven, I made a simple imbibing syrup. Imbibing syrups are used to add more flavor and moisture to the cake. They’re super easy to make. Just combine water and sugar in a small saucepan, place over low heat, and stir until the sugar has completely dissolved and the syrup looks clear. You can then add flavorings, if you like. I decided to spike the syrup with a little rum. But to be honest, I couldn’t really taste the rum in the finished cake, so I don’t think I used enough. I only used a teaspoon. If you don’t like rum by all means leave it out. Or if you DO like the idea of adding a little booze to your cake, use a little more rum. Or Kahlua. Or Irish Cream. Whatever you like! Just add it to the cooled syrup and splash the syrup over the cake layers during assembly. As for me, I think I’m making a coffee syrup to go with this cake next time! I bet bitter coffee flavor would go GREAT with all this chocolate. Once the cakes and syrup were cooling, I made the dark chocolate buttercream. I LOVE this recipe. It’s SOOOO chocolatey! It’s an American buttercream, which is usually not my first choice when it comes to buttercreams, because it’s soo sweet and not completely smooth. BUT. Because American buttercream is so delightfully simple (just butter, powdered sugar, and cream) it’s very easy to add a LOT of chocolate flavor to it in the form of cocoa powder, without having to make sure the buttercream won’t collapse. 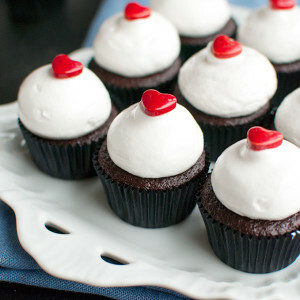 And because you beat the heck out of it, this buttercream is also super duper fluffy! Like a perfect chocolate cloud. It forms a slight crust if it sits for a while, too, so crusty-buttercream lovers rejoice! I decided to give the cake a ‘naked’ look, because I REALLY like naked cakes. I’ll probably never make a ‘finished’ cake again, I love naked cakes so much. I just think they’re super easy and very impressive! If you want more buttercream around the edges of your cake, though, you’ll probably need more buttercream (multiply the ingredients by 1.25 or so). Finally, the topping. I made a quick chocolate ganache to make those dramatic chocolate drips down the sides of the cake. For the ganache, I used heavy whipping cream and bittersweet chocolate, but you can also use milk chocolate if you like. The ganache will just be a bit lighter in color. The key to getting those perfect drips is making sure the frosted cake has had time to chill in the fridge, so the buttercream has had time to firm up. You then make the ganache (I always make it on the stove) and while the ganache is still warm and very runny, you spoon tablespoonfuls of it around the edge of the cake, pushing the ganache over the edge a little to create the drips. If you allow the ganache to firm up too much, it won’t drip down the sides properly. Thicker ganache makes drips, too, but the cake will look a bit more rustic. So make sure to use the ganache when it’s still runny if you want your cake to have those thin, neat drips. 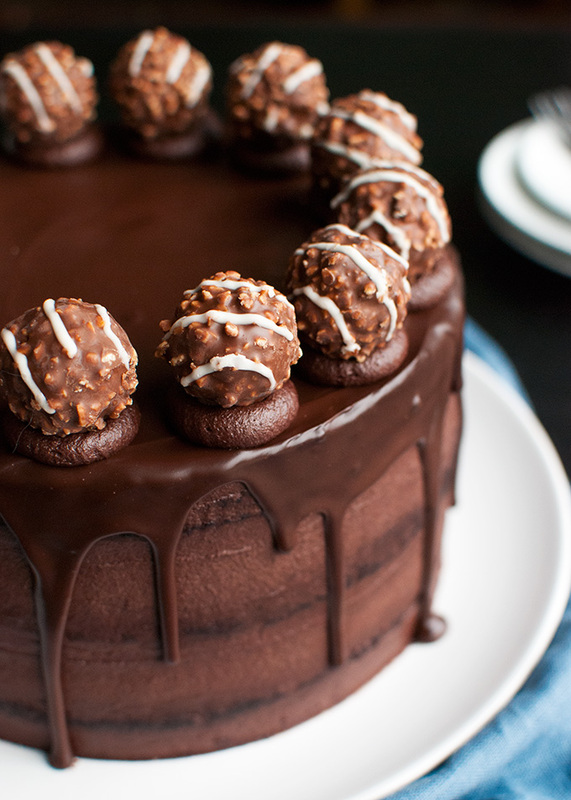 But with or without truffles, this cake is YUM! Just look at that filling. Delicious! Oh, and pinners… scroll down for a nice pin! 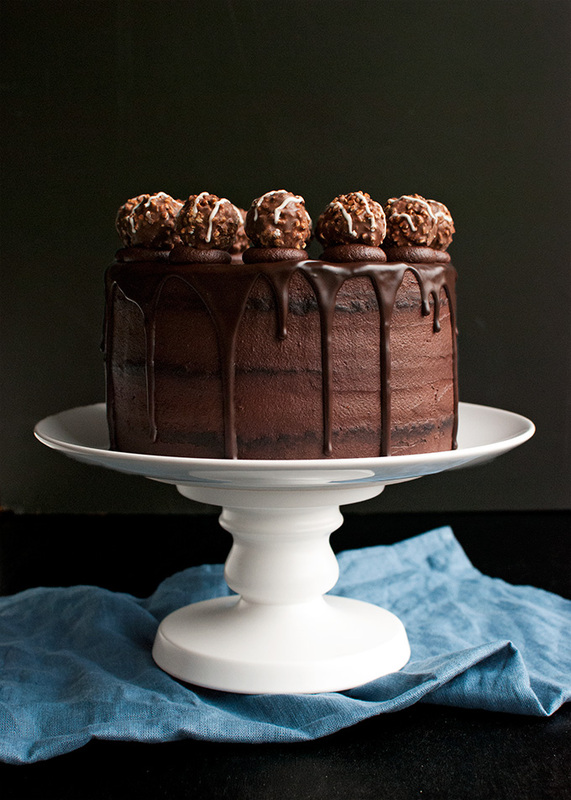 Three layers of moist, dense chocolate cake filled with a dark chocolate buttercream and topped with a dark chocolate ganache and truffles. Serves 12-20. In a large mixing bowl, mix together sugars, oil and eggs. In another bowl, dissolve coffee in hot water. Add the buttermilk and vanilla and stir together. In yet another bowl, stir together the flour, cocoa powder, baking soda, baking powder and salt. Add both the dry and wet ingredients to the egg mixture. Using a rubber spatula, stir until mostly incorporated, then mix for about 30 seconds until the batter looks smooth (albeit grainy fro the sugar). Divide the batter evenly over the prepared pans, then bake the cakes on a rack in the middle of the oven for 25-28 minutes, or until a tester inserted into the center of one of the cakes comes out clean. Remove from the oven and allow to cool to room temperature. In a small saucepan, combine sugar and water. Place over low heat, stirring with a metal spoon until the sugar has dissolved and the mixture looks clear. Remove from heat, transfer to a mug, and allow to cool to room temperature. Once cool, stir in the rum, if you're using it. In a medium-sized bowl, beat butter with a mixer fitted with a whisk or paddle attachment until smooth and fluffy, about 2 minutes. Using a rubber spatula, scrape the sides of the bowl, then beat for another 30 seconds. Add powdered sugar and cocoa powder. Combine vanilla, cream and salt and add it to the bowl as well. Using a rubber spatula or a wooden spoon, stir ingredients until somewhat incorporated and the mixture looks dry and crumbly, but not powdery. This is just so that you don't end up with a big cloud of powdered sugar and cocoa in your kitchen when you turn the mixer on. Place first cake layer onto a serving plate. Using a pastry brush, brush with an ample amount of syrup. Top with about a cup of buttercream, spreading it evenly over the cake layer using an offset spatula. Top with second cake layer, imbibe with syrup, and frost with another cup of buttercream. Top with final cake layer and imbibe the cake with the syrup. Reserve about half a cup of buttercream, then frost the entire cake with the remaining buttercream, scraping the sides of the cake with a bench scraper so that the cake layers show through the frosting. Place the cake in the fridge to chill thoroughly for at least 1 hour. Combine chocolate and cream in a small saucepan. Place over low heat and stir with a rubber spatula until all of the chocolate has melted. You don't want the mixture to get too hot, or it will seize, so pay attention. The ganache should be really runny. Remove the cake from the fridge and use a teaspoon to apply ganache near the edges of the cake so that it drips down the sides of the cake. Pour some ganache on top of the cake and spread evenly using an offset spatula. You'll have some leftover ganache. Place the cake i the fridge to allow the ganache to set. Fit a piping bag with a large open tip and fill with the reserved buttercream. 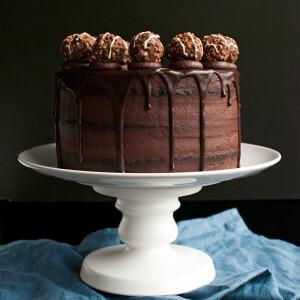 Pipe dollops of buttercream around the edge of the cake and decorate with a chocolate truffle. This looks like heaven to me! I love the naked cake look to and this is absolutely gorgeous! Thanks Meg! Don’t you just love how easy it is to make naked cakes look good, too? 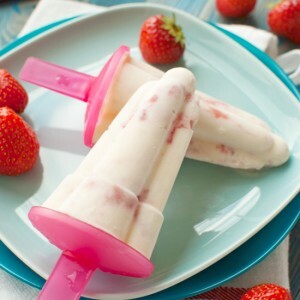 this looks so deliciously rich ???? 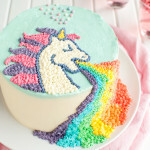 and i’m a person who likes a little buttercream with her cake (rather than equal ratios), so this looks perfect! Gorgeous cake. 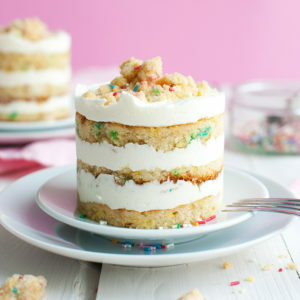 I agree that naked cakes are the most beautiful. Your drips are perfect. I always forget about making syrup for the layers. It makes such a difference in the cake on days 2 and 3. With this one, I am sure leftovers did not last long. Your idea of a coffee syrup is inspired. it would be perfect with the chocolate. I made this for a birthday party and it turned out fantastic! I didn’t have any vegetable oil in the house so I used olive oil and it was delicious! i also want to let you know that the ads on your website crashed my computer several times! I was using a brand-new chrome book and on wi-fi. Too many animated ads!